figure 7 Hand-colored tintype, full plate, ca. 1877. courtesy of Cornell University Library. In the tintype seen here (figure 7), the obvious difference in scale between the man and the woman suggests that this is a composite of two photographs placed side by side and then re-photographed, to create a joint portrait. A hand-colorist painted over the floor and background to hide the seam joining the images and extended the man’s elbow into the woman’s half of the photograph. 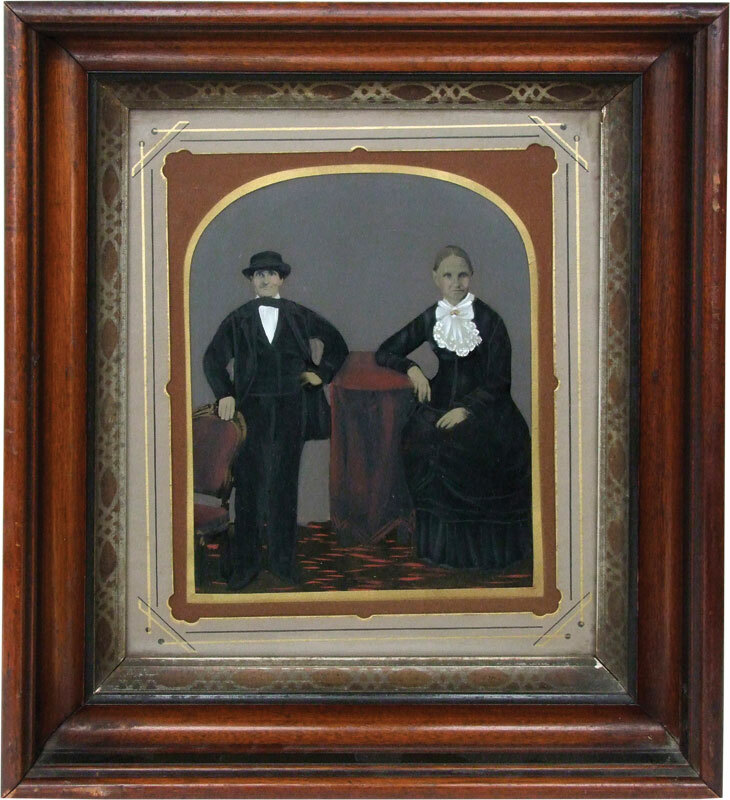 We know they were probably not people of means from the choice of the inexpensive tintype reproduction, the simple frame, and the relatively poor quality of the joining of the photographs and the hand over-painting. The woman’s two-piece dress with a long bodice, wide, white-laced collar with a bow and brooch dates her to the late 1870s. The man’s clothing dates him a decade earlier, though the artist seems to have taken liberties such as shortening and slimming his coat to update his fashion. From all of these clues, one can craft a story. My theory is that the image was commissioned in the late 1870s by a widow who lost her husband ten or fifteen years earlier, before they had the opportunity to take a photograph together. She combined an older photograph of him with one of herself, to create a memorial of their union that would survive his death, and eventually her own. The majority of images that survive from the nineteenth century require some detective work of this sort. While we must remain suspicious of our human impulse to invent stories from incomplete or ambiguous evidence, ferreting out facts through the analysis of surviving physical clues can feel like rediscovering a long lost piece of history. Dawn’s Early Light features just some of the highlights from the Stephan and Beth Loewentheil family collection, a collection of more than sixteen thousand nineteenth-century photographs deposited at Cornell by the Loewentheil family. The new collection expands Cornell University Library’s deep textual strengths in nineteenth-century American history and reinforces a collecting philosophy that seeks to preserve the physical historical evidence future scholars and students will depend upon. At a time when information of all kinds can increasingly be accessed digitally from anywhere on the planet, rare book and manuscript repositories like Cornell’s are recommitting themselves to preserving important physical collections, alongside ongoing efforts to expand digital access. Hence the theme of creative destruction also lies at the center of the broader context for this exhibition. Just as photography once threatened painting, many people believe that the digital revolution now threatens the relevance of physical collections. But photography, as we have seen, ultimately brought new ways of seeing and methods of creating and strengthening, for example, a painter’s capacity to innovate by encouraging artists to focus on what was unique and irreplaceable to painting. Cornell’s approach to collecting seeks to accomplish something similar, with strategies that focus on preserving important historical evidence for which screen access will never suffice. By collecting and preserving physical artifacts, research libraries ensure the future’s ability to access a more complete picture of the past and present. But please note: no reproduction of a daguerreotype—digital or otherwise—can convey even the remotest sense of the experience of looking at its mirror-like, silver surface, changing the angle of viewing ever so slightly to see first, oneself, then, the subject, in alternation. Nor can a viewing of any digital reproduction replicate the experience of seeing the physical objects that preserve our histories. Dawn’s Early Light: The First 50 Years of American Photography runs until May 4, 2012, and is available online. Jenny Bagert is a photographer and collections consultant.